I’ve been sucked into a low-pressure system of Low Ambition Knitting. I’d call it a tropical depression except that I actually am feeling kind of low, so let’s just say we’re in a cone of uncertainty. I’ve been reading patterns endlessly these days, looking for that perfect thing to make, but nothing has grabbed me. I think I’m letting the perfect be the enemy of the good. Well HELLO DEBBIE NEW, you truth teller! I have a sizeable bin of leftover yarns from this, that, and the other, and the other day I just started knitting from it. The Mitered Crosses blanket, which I finished and will show you shortly, gave me the most profound love for combining mitered squares and log cabin. It’s funny how even this pointless piece of knitting quickly demands rules. After a couple of patches, I realized that I had a lot of rules. 1. Everything has to be worked on a size 9 needle. 2. DK or worsted weight only. 4. Heather yarns to be avoided unless they’re not too hairy. 5. No white, cream, or black. 7. Use what is in the bin. No purchasing of yarns allowed. This little project is 100% addictive. I am getting itchy to make another square, just looking at these pictures. I have no idea how long I’ll do this, but I’ve got at least three seasons left on Friday Night Lights, just saying. Of course, you know that Rule Number 7 is about to kill me. Why doesn’t that bin have any indigo DK or worsted yarns? Rule 7 is blasphemy. You can’t live like that. I won’t let you. 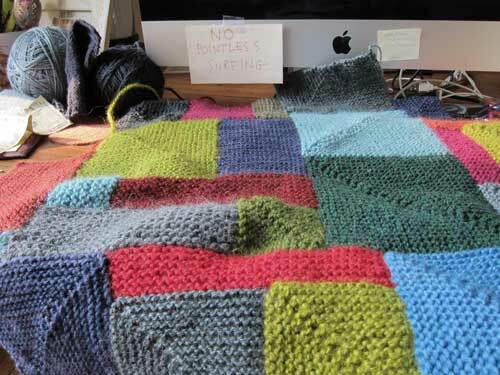 I can’t believe that YOU are knitting this aimless (beautiful) (compelling) thing. It’s like you’re channeling Cauchy down there. In fact, this is quite inspirational. Attaching one block of whatever at a time? I might actually make something blanket sized with that idea. So what are you stocking up on as the hurricane approaches? Or is it all just left over yarn bits and Unexpected Knitting? You need a kerosene lamp, booze to keep the unexpected going, you know. I’m so glad I live here in the Midwest. Not even a tornado is likely to hit in my part of Chicago. Too many tall buildings in the way. You know you’ve just started a major outbreak of copycat blankets! I’ve been stacking up mindless squares while I wait for insporation. Yours is much prettier. InspIration, of course. Drat this phone! “Insporation” would be from one of Ann’s “many moods of mushroom” blankets. Also very exciting. Are there any rules against dyeing some of the yarn indigo? Or, at the end you could overdye the entire piece in a pale wash of one color to harmonize them all. I’m working on a blue & white numberin cotton at the moment: 5 blues and 3 whites with a touch of color here and there. I have my own set of rules. It makes it challenging and more fun. Well, that IS unexpected ~ and quite lovely! Darn colorful, too. I’m just wrapping up Square 16 on my Buncha Squares log cabin blanket, and now you’re giving me thoughts of freeform assembly. Which could be a bad idea . . .
Maybe Ann you should have a yarn swap for this project. If you don’t buy yarn for it, but swap a heathered yarn or a variegated yarn you don’t want to use for a navy or indigo you are anxious for, then that is still within the rules right! I think you’re allowed to bend #7 to include purchased yarn for the edging. And some of it might slip over into the stash bin. Yeah, that’s the ticket. Stu-nning! You don’t even need indigo, really. Nope, I say keep rule 7 for as long as you can stand it! All I can think about this summer is knitting quilt pattern blankets. I’m partway through a log cabin design (those squares are absolutely the best thing to take on the bus commute to work) and have yet to try your mitre squares, but it’s definitely next on my list. Love the random use of colour and pattern with this. And have you seen the “beekeeper’s quilt” on ravelry? Another absolutely addictive way to use up the scraps. Can one have 3 knit quilts on the go and even hope to have one finished before the first snowfall? Swap! Swap for those desired colors. (Seanna Lee said it first, but it bears repeating). Gosh, Rule 7 seems overly harsh. I am totally drop-dead in love with this project, though. Love the blanket — it’s a great idea! Regarding Rule #7 — what happens if you run across a “Not to Be Missed” yarn sale at your LYS that includes indigo? Just throwing it out there. Ooh, lovely. I’m tempted to try my hand at something similar but I have very little solid color yarn and would have many more rules. I spend my life trying to overcome my Germanic rule-loving ancestors but have little success. Achtung. Zese are ze way we make ze knitting. *sigh* I’m a free-spirit trapped in a steel helmet with a pointy top. You have three seasons UNVIEWED of FNL?!? It’s the best show ever (well, at least in the top 10) and you are going to absolutely love the final episode. Get viewing and knitting, lady! You know what they say. Rules. Made to be Broken. or bent. or mitered. This is a great idea! I can see grabbing on to this! But then, I always develop a plan and it starts looking like a pattern. Maybe this time…. LOVE IT. Great idea. Once I finish a few other things, that seems like a great idea for my oddball leftovers. Can’t wait to see the end. I came late to the Mason=Dixon party and have been enjoying the first book very much. I started with the log cabin blanket and have made two. I am now working on on in chrochet. 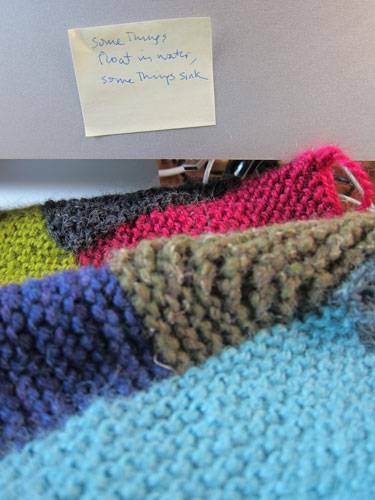 I love knitting rectangles, and thank you for pointint that out to me. 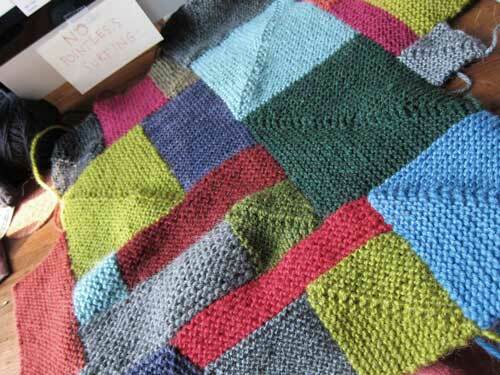 I have just finished a blanket knit in the round with scrappy yarn from a pattern on Ravelry. It took almost six months and in the very hot weather It got replaced by smaller projects. After I finished the blanket I needed something small and with a little challenge. I am working on my third Ball Band Wash Cloth and having a ball. I am knitting up combinations of yarn I have on hand. Thanks for the book, and thanks for the web site. I hope you’ll be posting the basic recipe for this, as you have for so many great blankets. I’ve made a lot of your blankets over the past few years – I love your ideas. Mitered blanket for Japan has been entered in the State Fair of Texas – we shall see what happens. If you kept your rules to a single sentence, you could put indigo DK or worsted in the bin and then the bin would have some indigo DK or worsted. I don’t know how you are going to stick to rule #7 – good luck with that! I love it by the way – I have done the same thing with crochet & it is addictive! What you do is order the sample wool kit for $5US from the woolen mill in Shrewsbury England. You’ll get armloads of swatch size skeinlets and at least one or two 50 gram balls. one is bound to be indigo! OMG – if I could have imagined The. Perfect. Thing. to. Read. today, this post would be IT. Thank you! I am *not* alone! Particularly appreciate the post applied to laptop. Am tempted to do same. Onward to more mitered squares and log cabin. OMG! I absolutely LOVE this!! You may have just solved my next afghan dilemma…. Thanks!! You rock, Ann! Thanks also for mentioning Unexpected Knitting – it looks tremendous. Can’t wait to have the chance to see it in person. I’m all for mindless knitting at the moment as my son is caught up in the hurricane madness over there. Blanket is groovy – are you allowed to EBay for indigo yarn -you can bend the rules if they are your rules!!!! Why do I suddenly have the urge to knit a blanket? How FUN is that! Insportational, transportational and motivational all at the same time. I’m forever trying to be good and use my stash without additional purchases. I’ve failed every single time. This might actually allow me to succeed. Maybe. If you happen to find some indigo DK, you could drop it into the bin with your eyes closed. If you don’t see yourself doing it, it didn’t happen, right? This blanket is really lovely! I’d love to win either of these books! Love the “no pointless surfing” post-it! I can’t believe how much of that I do when I am so tired it seems like more work to go to bed than not to go to bed. re: the Disturbing Handknits tweets:: a perfect foil to the back-to-school running I am doing today. RollingOnMyKitchenFloorLaughing. Love this project as I have made many like it and no 2 are alike. Each person who receives an afghan from me is unique. Loved your blanket so much I ordered the book. It just arrived and I am beginning to read it. I’ve too many projects on needles to begin right now, but in the near future. LOVE IT! that’s fly-by-the-seat-of-your-pants brilliant.